Weddings are undeniably special occasions and you’ll see some of the most beautiful and most elaborate cakes ever baked on display at wedding receptions. You’ll also see some of the most over-the-top cakes, for better and for worse. One of my favorite instances of this is a life sized wedding cake made to look exactly like the bride herself. It was certainly memorable, down to the matching dress, bouquet and hairstyle of the bride. 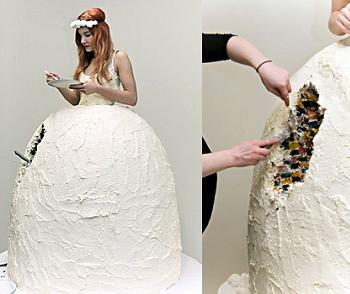 This wedding cake wedding dress, a designer creation by Lukka Sigurdardottir that is unlikely to be appearing at any real ceremonies in the near future, was built along a similar vein. Instead of making the bride out of cake to wear the cake dress, this gigantic dress-shaped wedding cake has a real woman at the center – “wearing” the dress! Naturally, she can’t move too well in the outfit, but she is in a good position to snack on the rainbow-colored, multi layer cake while she waits to be rolled – since walking is pretty much out of the question – down the aisle. Next PostNext What are your least favorite Girl Scout Cookies? all I can say is WOW!!!! Really lip smacking…YUMMY!!! OMG that’s really fantastic. unbelivable. Is this really really ONLY cake or sugar? or is she standing in paper? and the outside is filled with cake? Wowowowow,never saw any (or imagined ) like this….. This is really beautiful..one of the best cake I’ve ever seen.